In Japanese 'raku raku' means 'comfortable' or 'easy'. The Fujitsu Raku Raku F12-D smartphone is specifically created for the elderly and people with disabilities including impaired motor skills, vision loss. The specially adapted interface controls includes a number of keys that are used most often as well as voice commands and tactile feedback, the increased size and easy to use widgets. On the screen are the most frequently used function keys designed for voice calls, access to messages and contacts. For people who are hard @ hearing the F12-D smartphone comes with some standard noise cancellation techniques, the phone will also actually slow down the voice on the other end to make it easier to understand. The Raku Raku F12-D smartphone features a 4-inch display @ 480×800 pixel resolutions, powered by a 1.4 GHz Qualcomm Snapdragon MSM8255 processor, sports an 8 MP rear camera, a 0.3 MP front camera, runs on Android 4.0 OS, Wi-Fi, TV tuner and a NFC chip. The smartphone is also water-resistant and dust-proof. 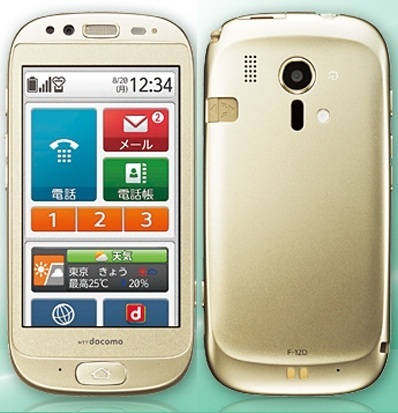 The F12-D device is available only in japan via NTT DOCOMO which has a monthly plan at ¥2480 ($31 approx/-), a standard "unlimited" (up to 7GB) LTE package at ¥2980 ($37) a month. 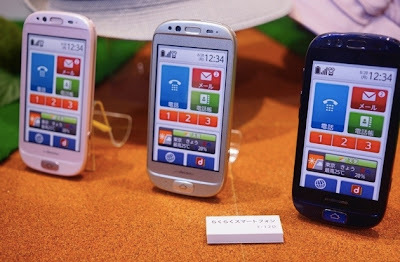 Tags: smartphone for physically challenged, smartphone for elderly people, smartphone for senior citizen, Raku Raku F12-D, Fujitsu Raku Raku F12-D, Fujitsu Raku Raku F12-D features, Fujitsu Raku Raku F12-D specifications, Fujitsu Raku Raku F12-D review, Fujitsu Raku Raku F12-D details, Fujitsu Raku Raku F12-D availability, Fujitsu Raku Raku F12-D specs, Fujitsu Raku Raku F12-D images, Fujitsu Raku Raku F12-D pics, Fujitsu Raku Raku F12-D pictures, Fujitsu Raku Raku F12-D price.